Arijit surrendered at around 12.30 a.m. outside the famous Mahavir temple near the Patna railway station. 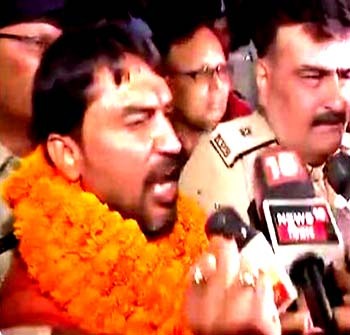 He shouted slogans like "Jai Shri Raam", "Bharat Mata Ki jai" before surrendering, district police official Rakesh Dubey said. Arijit will appear before a Bhagalpur court on Sunday. Last week, a case was lodged against Arijit, a Bharatiya Janata Party (BJP) leader, on charges of taking out a procession without prior permission, inciting communal sentiments and roaming with arms on the streets of Bhagalpur. He had moved a bail plea in a civil court, following which the court on March 27 sought the case diary from the police to ascertain his role in the communal flare-up on March 17. The court then issued an arrest warrant against Shashwat. Choubey has already described the FIR as "a piece of garbage" that was registered by "corrupt police officers in Bhagalpur". Arijit unsuccessfully contested the last assembly polls as the BJP candidate from Bhagalpur, considered a stronghold of Choubey, who was elected MP from Buxar in 2014.